A well-known face at our local farmers’ markets, Katie Zubia moved to the valley in 2014 to help her parents manage Wood River Ranch. Raised on cattle ranches, Katie has been involved in animal agriculture her whole life, and holds a bachelor’s and two masters’ degrees in animal science. As president of Wood River Farmers’ Markets Association Board, she plays a vital role in our community food system. 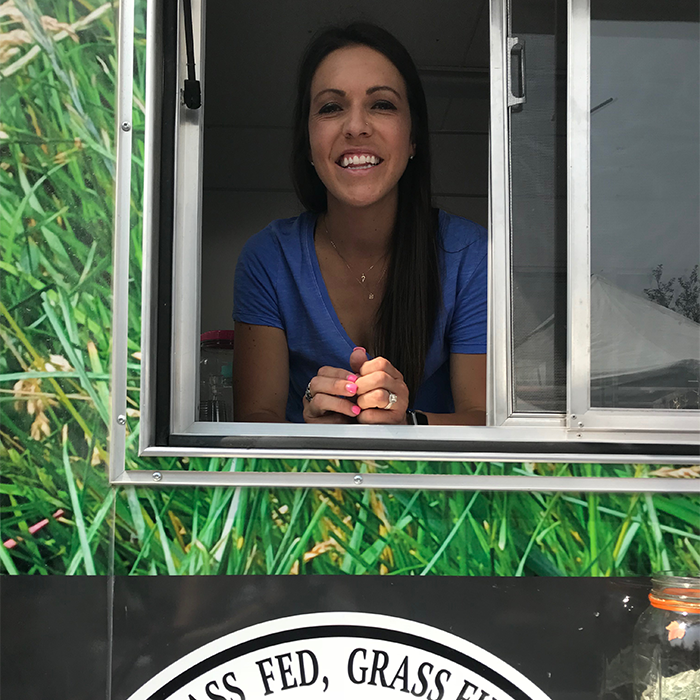 Read on for Katie's thoughts on why grass-fed beef is healthy for us and the environment, and the future of our local markets. Describe an average day working on a ranch. With my job, I never really have an average day. My daily schedule varies depending on what time of year it is. During the summer months (June-October), I’m in charge of selling our beef two days a week at the local farmers’ markets. Our butcher is in Nampa, so one day a week I spend driving to and from Nampa to take steers and pick up our beef. My job also includes making beef deliveries to our customers here in the Wood River Valley. I also help out with daily ranch work which just varies depending on the time of year. How and why can beef be considered part of a healthy diet? Beef is healthy. It provides vital nutrients such as zinc, iron, protein and B vitamins. Did you know that just a 3-ounce. serving of beef gives you half of the protein you need in your daily diet? Protein from beef contains all the amino acids necessary to build muscle and repair tissue. Consuming high quality protein such as beef is great for weight loss because it satisfies hunger and keeps you satisfied for hours after consumption. Beef also has a good amount of iron and the form of iron it contains is more easily absorbed than the iron in plant-based foods. If you’re worried that beef is high in fat, keep in mind that grass-fed, grass-finished beef is typically lower in fat than grain-fed beef. The fat that grass-fed beef contains is also healthier for you. Grass-fed beef contains twice as much of the heart-healthy omega-3 fatty acids. Grass-fed beef also contains more CLA’s (conjugated linoleic acid) which has cancer fighting properties. Increased amounts of antioxidants in the form of Vitamin E are another benefit of consuming grass-fed beef. What about environmental concerns with raising cattle? Beef is environmentally friendly. Grazing cattle aerate the soil. They also eat brush and prevent over vegetation, which is good for wildfire management. A lot of time, cattle graze on land that is too steep, hilly or rocky for farming. Cattle are excellent at using water, grass and sunlight and converting it to nutritious beef and beneficial by-products that we use daily. What are ways that our community can support you and other regional farmers/ranchers? Most importantly, by buying our products! Sometimes our products may be a little more expensive than the mass-produced products you find in the grocery store, but they are definitely higher quality. Our products are going to be a lot fresher than what you would find in the grocery store and don’t contain preservatives and artificial ingredients. It’s also important to support our local economy and recognize the hard work that our farmers and ranchers put into producing products for you and your families. Another way you can show us your support is by asking your questions directly to us. There is a lot of misinformation out there involving agriculture. There are also a lot of people who claim to be experts that haven’t spent a day in the field or pasture. If you could share any wise words with beef lovers, what would it be? Keep on loving beef! There isn’t a more nutritiously dense, flavorful, and versatile food out there. Also, don’t be afraid to try a new recipe or a different cut of beef. There are so many delicious cuts and ways to prepare beef. At Wood River Ranch Beef, we have over 20 different cuts! What’s your favorite way to enjoy Wood River Ranch beef? I like to be adventurous and try new things but my favorite is just a good old hamburger. At the Ketchum and Hailey farmers’ markets, we don’t just sell our packaged beef for you to take home and cook yourself; we also have a “cooked food menu” and offer a couple beef items including our famous $5 hamburger. I don’t think there’s anywhere else in the valley where you will find that type of deal, and you sure won’t find a better hamburger. Where can people buy Wood River Ranch beef? We attend every Ketchum (Tuesday) and Hailey (Thursday) Farmer’s Market from June to October so be sure to visit us there. Aside from the farmers' markets, if you’re craving a burger made from our delicious beef, head to Smiley Creek Lodge. We’ve partnered with them for four years now and they make a fantastic hamburger with our 100% grass-fed, grass-finished ground beef. What do our local farmers’ markets mean to you? Wood River Ranch Beef has had a booth at the Ketchum and Hailey Farmer’s Markets since the summer of 2013. I moved here in the summer of 2014 and have been running our booth and beef business since then. The farmers’ markets are an excellent place to sell our product. They are a great draw for people who like to shop local and support local producers. Early on, I realized how vital our involvement in the markets would be to the success of our business and decided to get involved more deeply by running for a spot on the Wood River Farmers’ Market Association Board. I got elected to the board in the spring of 2015 and went on to become president of the board in the spring of this year. I am very passionate about both the Hailey and Ketchum markets. I feel both play a vital role in the food system of our valley. It’s important to provide our community with local, fresh, and delicious products. We have so many outstanding producers that participate in our markets and fulfil this role. I believe it’s important to provide those producers with a viable place to sell their products and make it a win-win opportunity for all those involved. Why is it so important for our community to support the farmers’ market? The Wood River Farmers’ Markets have been going strong for close to 15 years. We have an excellent assortment of vendors/products. We take time to select local vendors that offer unique, top quality products that you won’t find anywhere else in the valley. As a vendor, sure, this is a business, but it’s also a chance to give our community the ability to purchase our high quality, local products directly from us. In this day and age, it’s becoming more important to know exactly where your food is coming from and a farmers’ market is the perfect place to do that. We have so many amazing customers. Many who visit the farmer’s markets every week! We love this support and it’s because of you that we can continue to have our businesses and markets. A lot of our markets’ success also depends on the support of the cities in which we hold the markets in. We want our markets to be centralized and easily accessible by our customers. Our location in Ketchum Town Square this past summer was ideal for business. We had record customer attendance and business was up for almost every vendor. The City of Ketchum claims to support us but their proposed location change for the market next year and their ever-growing list of fees and requirements tells us otherwise. We are a small volunteer board whose members are stretched thin with their own businesses. We need our customers and supporters to help us make the City of Ketchum realize how valuable our farmers market is to our community. All small-scale ranchers and farmers. A lot of people are quick to criticize us but will eventually find out we are needed. We don’t always get the appreciation we deserve. It takes a special person to care for the land and animals like we do. Tourism is a big business and is what drives our local economy…even down to our local food. Like I’ve said before, we have a great customer base. We have a lot of local customers but we also draw in a lot of tourists at the farmers’ markets. I would, however, like to see more of a push for locals to buy local food. We should try to focus more of our efforts to help people in our valley realize that we have an abundance of local food and it can be affordable. I know there are a few programs available that aim to do this but I feel there is more that can be done. Concerning the farmers’ markets, I wish we didn’t have to hold them in the middle of the work day. However, with our producer’s schedules, it’s hard to hold a market after “work hours” and a handful of our producers participate in other markets on the weekends. Any input on how to help with this problem is greatly appreciated.